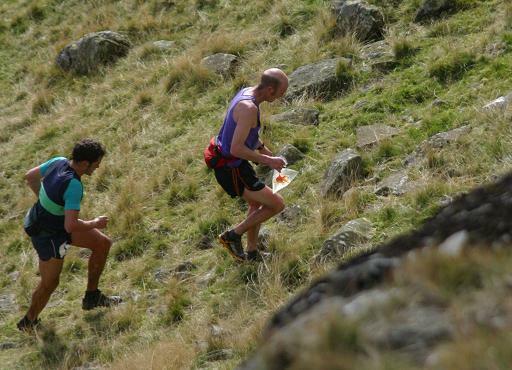 The Sedbergh Hills race this Sunday will decide the 2011 Fell Running English Championships. It counts as a Long at 16miles and 6500ft. Not on the 9 August entry list – Is this the effect of the Whittle Pike dislocated shoulder? Did he pick up an injury at Borrowdale? Is this an injury he can shrug off as quickly as he normally does? Winner of Borrowdale and Wasdale 2011 - the most recent classic long races. 2nd to Lloyd Taggart at Whittle Pike. One of the most consistent racers of the last decade. Has no long counter yet – a win at sedbergh could bring him 52 points taking him to 203 putting him in the clear lead. A top 8 finish could give Lloyd the championship. Jim Davies, currently 6th in the Mens and 2nd in the MV40s, chased by Ben Abdelnoor, currently 3rd in the Mens. Photo by http://www.keswicklakedistrict.co.uk taken at The Langdale Horseshoe 2009. Jim beat Ben Bardsley at Chris Steele’s wedding race even though he was wearing a wedding dress. Former British Champion and Matterhorn ‘survivor’. No Long counter yet........7th at Sedbergh last time it was a championship (2006)…… lives in Sedbergh – no excuses! But we must remember……. this is also a British Championship race, Morgan Donnelly, Tim Davies and Andrew Davies are on the entry list too. Have a good race lads! Race report to follow on Sunday night on Fell Running Briefs.